The picture above on the left was taken in 1992 just before Yakubu Gowon's son,Musa was arrested in the US for drug trafficking. mum where he lived until his arrest in 1992. 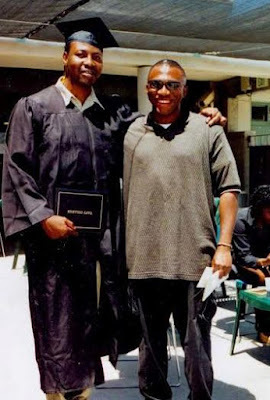 While in jail,Musa studied and graduated with a degree in law..The second picture is of his half brother Richard. On November 18, 1992, agents of the Drug Enforcement Administration and the United States Customs Service arrested Musa, Jack Spencer, for conspiring to import in excess of one kilogram of heroin. 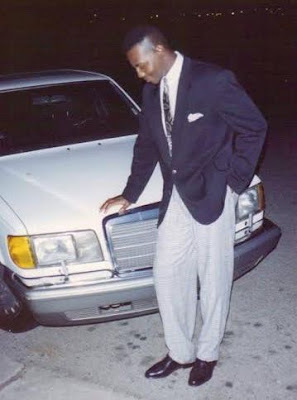 Jack Musa Gowon, who was 23 years old at that time was sentenced to 40 years in prison for the allegation of smuggling heroin from source countries. Jack Musa Gowon protested vehemently through his legal team that he was innocent and was framed up and his protest were ignored by the Jury and was harshly sentenced to 324 months in prison followed by five years of supervised release. As an inmate of Taft Correctional Facility, Musa Jack Gowon was a role model and a legal adviser to all the inmates. Musa Jack Ngonaadi is grateful to his Dad, General Yakubu Gowon, his friends and his relatives from his maternal side who stood by him and supported him also all through the period of his unjust incarceration that he did not commit the crime he was wrongly accused of. It has to be said though that the information in this article was released by a PR company.I guess Musa is trying to put his public image together readily for his time in public.